A self-driving Ford research vehicle. Ford Motor Co. is pairing with Walmart to begin laying the groundwork for a driverless grocery delivery service. The two companies will test the concept as part of an existing grocery-delivery partnership between Postmates and Walmart. Ford vehicles will eventually be mocked up to appear autonomous and simulate the process of consumers retrieving their groceries without the help of a human driver. As self-driving cars come closer to reality, automakers and tech giants are increasingly viewing driverless deliveries as even more lucrative than the robo-taxis that will initially hit the streets to transport commuters. Automating the arrival of goods to consumers' front porches would slash shipping costs roughly in half, experts say. Consultant McKinsey & Co. predicts that in less than a decade, 80 percent of all items will be delivered autonomously. Ford has already been testing autonomous deliveries of groceries and other goods with Postmates and Domino's Pizza. Alphabet Inc.'s Waymo, which plans to launch a commercial driverless car service next month, has a partnership with Walmart to transport online shoppers to its stores. The pilot program with Ford is taking place in Miami-Dade County, says Tom Ward, senior VP of digital operations for Walmart U.S. in a blog post. "Through it, we aim to learn more about how we can take advantage of self-driving vehicles to deliver fresh groceries – hand-picked by our personal shoppers – to customers." 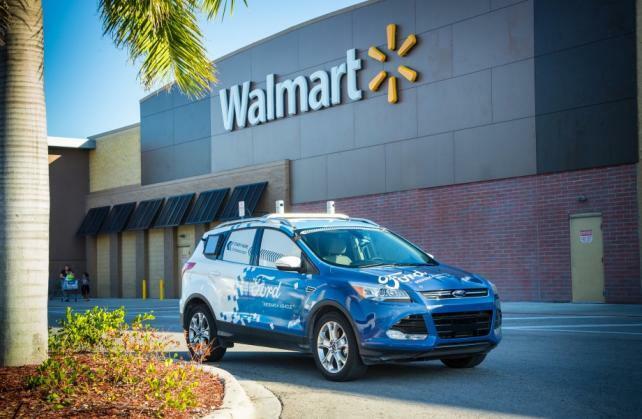 "Like us, Walmart believes that self-driving vehicles have an important role to play in the future of delivery," Brian Wolf, director of business development for Ford's autonomous vehicle business, wrote in a Medium post. "Together, we'll be gathering crucial data about consumer preferences and learning the best way we can conveniently connect people with the goods they need." Ford has underwhelmed some investors by plotting a later arrival for its autonomous vehicles than competitors including Waymo and General Motors' Cruise. The company has vowed not only to deliver a purpose-built self-driving vehicle by 2021, but also a viable business model to go along with it. Still, the approach Ford has taken appears to have turned heads at one major competitor. Volkswagen AG has been in talks with the company about joining forces on various projects and is mulling an investment in Ford's self-driving partner, Argo AI, people familiar with the matter told Bloomberg News earlier this month. Others grocers are also eyeing a self-driving future. In June, Kroger, the largest grocery chain in the U.S., announced in June a partnership with autonomous-vehicle startup Nuro to test the delivery of groceries in unmanned road vehicles that can steer from the store to a customer's home.